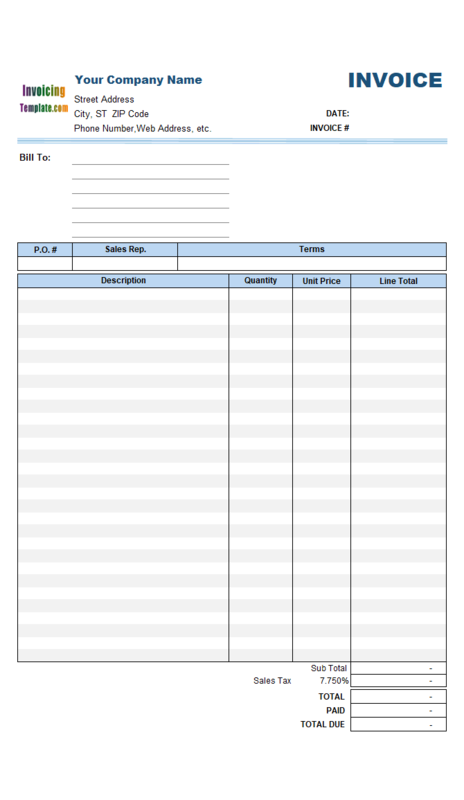 This is the eighth sample of the multiple-price serial invoice templates. 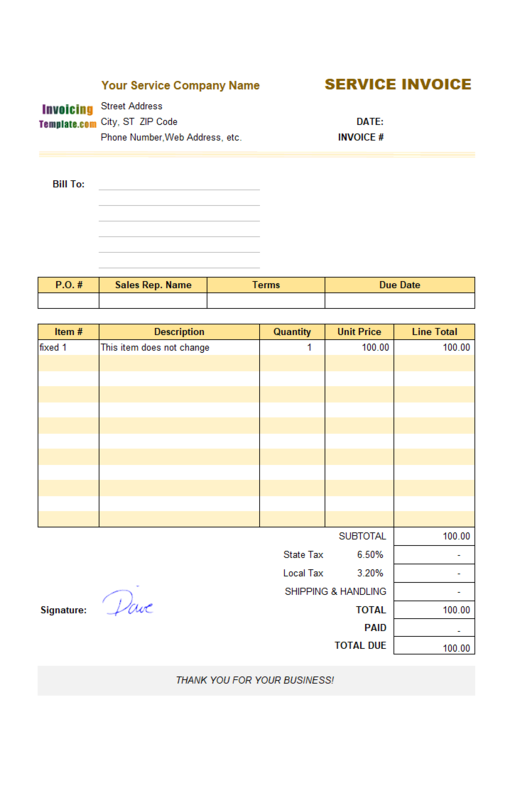 The template uses percentage discounts, and has no shipping fields. 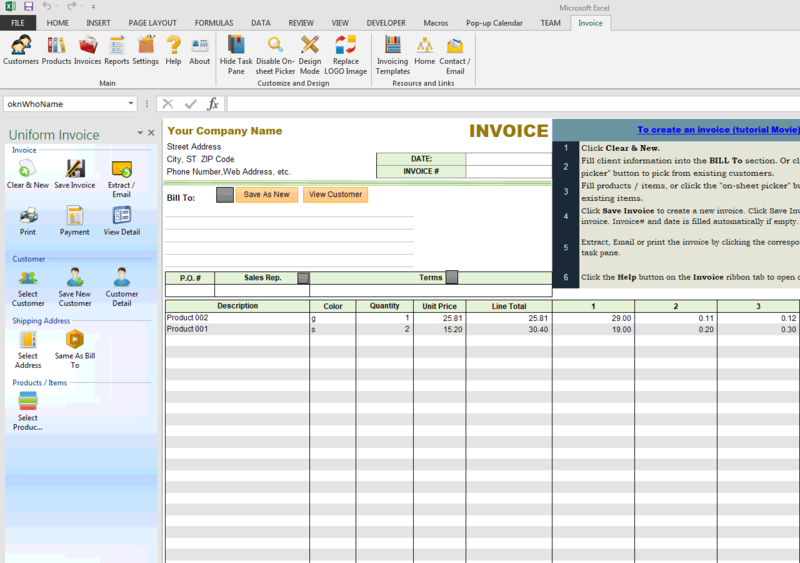 c5030 now includes the customized invoice template for the latest version of Invoice Manager for Excel. This is what you will see when you open five-price-levels-service-percentage-custom.xlsx. 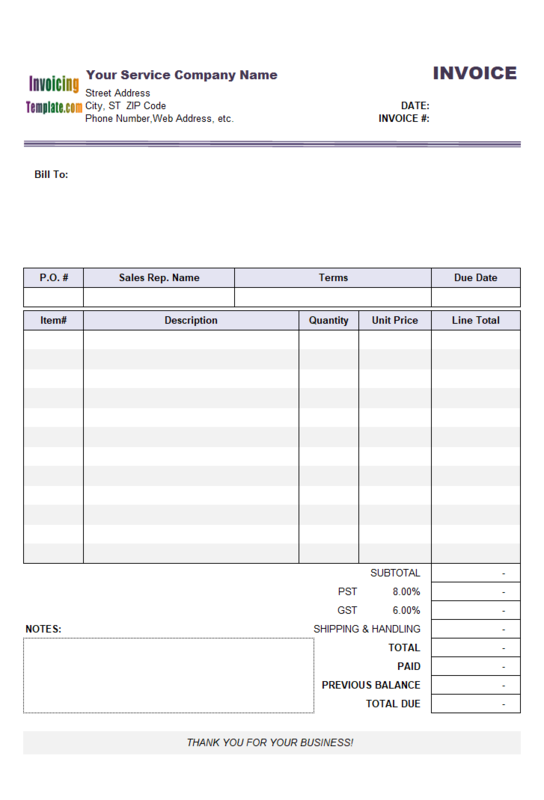 Just like the other service invoice templates available here on InvoicingTemplate.com, this invoice form with 5 price percentage levels (service, cosmetic) was created from the sales invoice template by moving all the shipping fields out of the printable area. 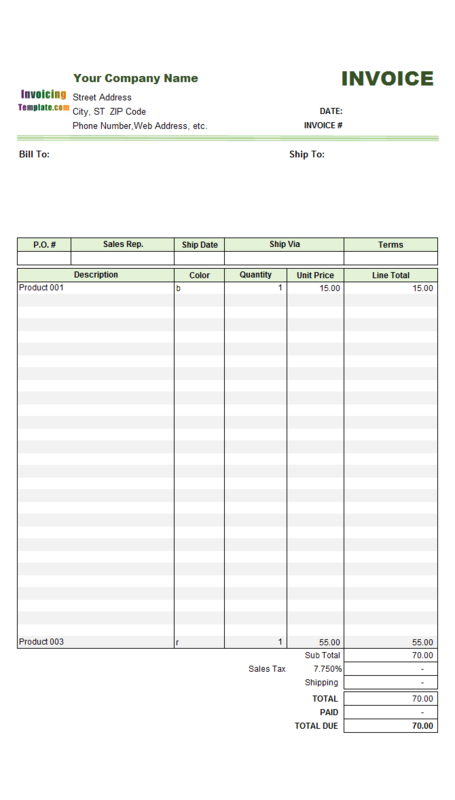 The printable area is the white area on the center of the "Invoice" worksheet, which is section that is printed when you execute the "Print" command in Excel. 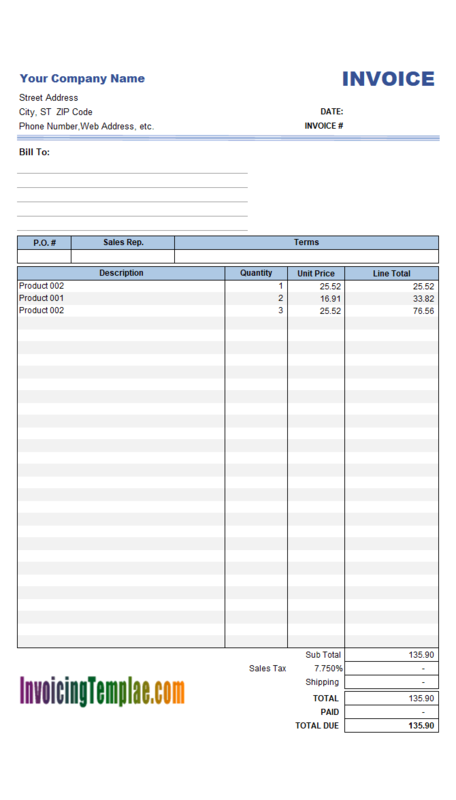 It is also the section that is extracted when you execute the "Extract" command in Invoice Manager for Excel (namely Uniform Invoice Software). Moving the location of a cell or field is easy in Excel. To do this, you first unprotect the sheet (if the sheet is protected), and then select all the cells or fields you want to move, and then drag the border of the selected area to move it to the new location. If you need to move an Active X control, such as the "select a shipping address" icon button, you first need to switch to design mode, and then click and drag the icon button to the new location - in this case, outside the printable area. 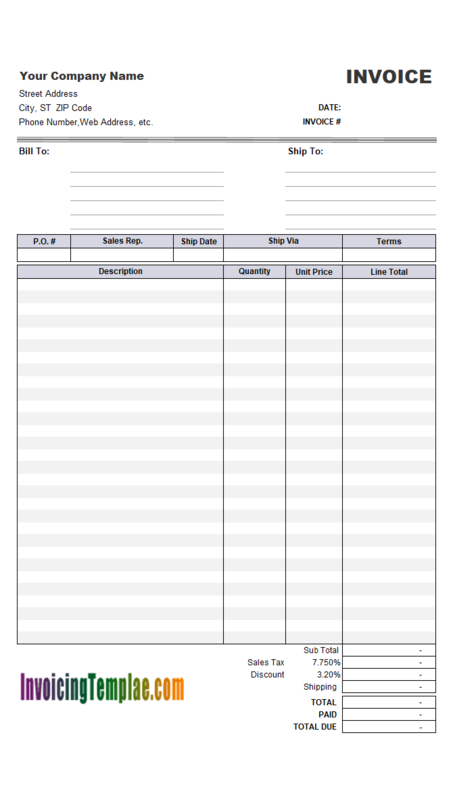 After moving out the "Shipping Date" field, you may like to expand the size of the neighboring fields to make the layout organized. 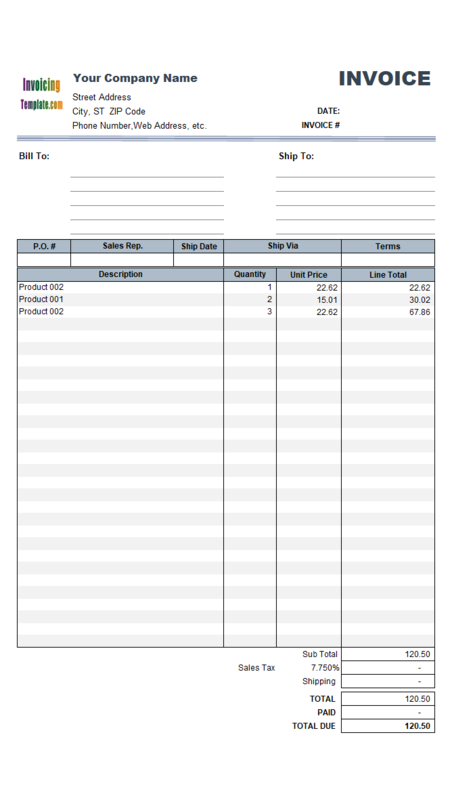 This is done by expanding the Terms label and field. 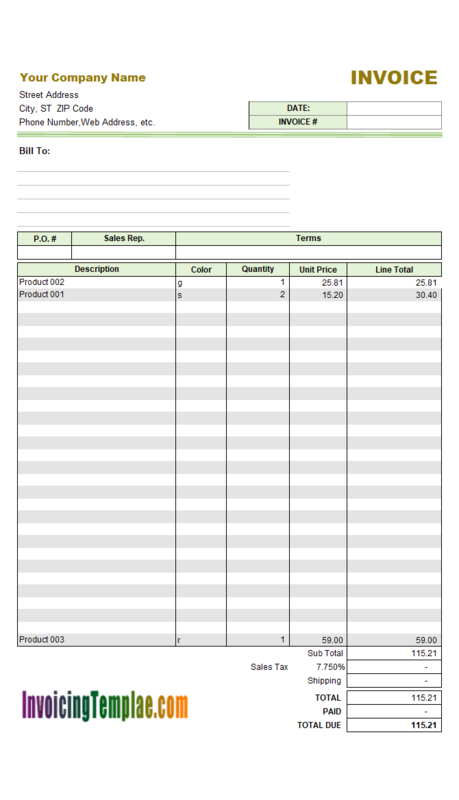 Expanding the "Terms" label is done by first selecting the original terms cell and the empty cells left by moving out the "Shipping Date" field, and then execute the "Merge and Center" command on Excel ribbon tab. 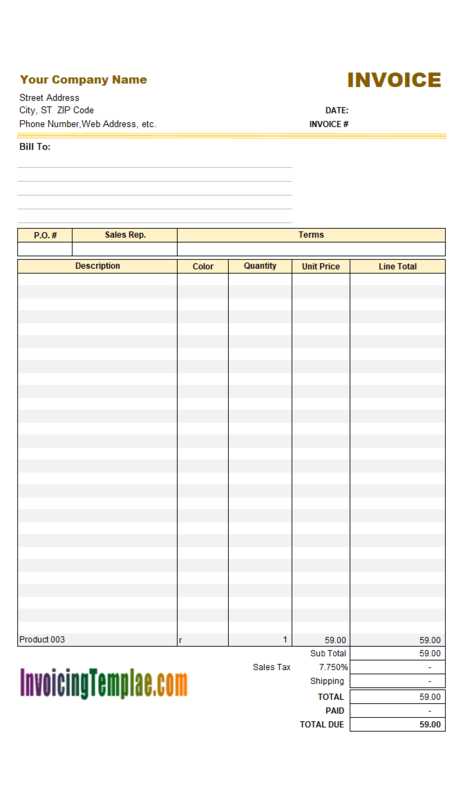 To do this for the Terms field, you first need to move the original Terms cell to the first (left-most) cell of the empty space, and then select all the cells you want to merge, and then execute the "Merge" command. 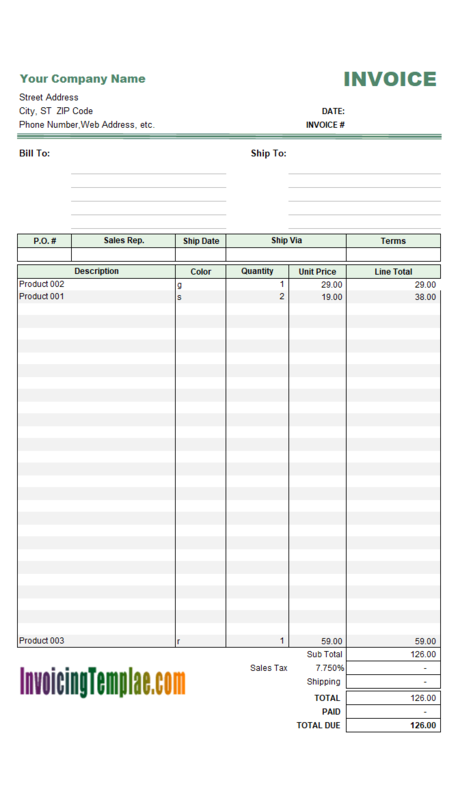 This invoice template has the "Color" column on the invoice body, which is defined as a custom field. 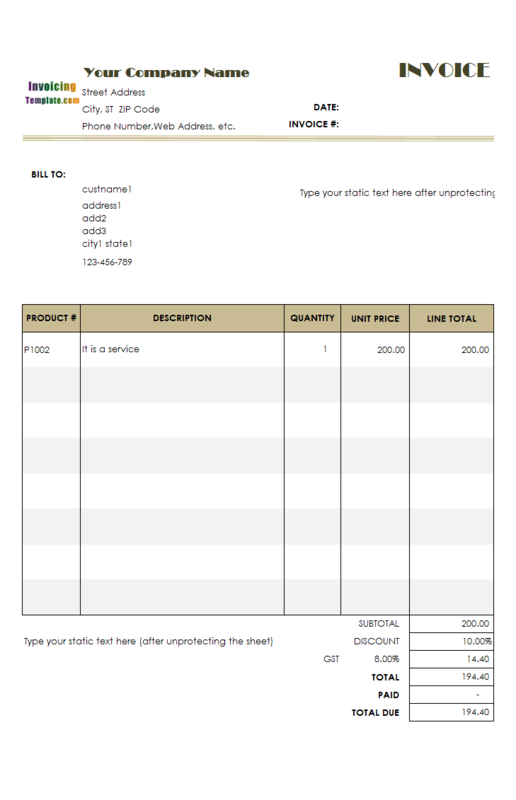 For more information on the purpose and usage of custom fields, please refer to the documents included Invoice Manager for Excel (namely Uniform Invoice Software), which you can download for free and within the trial period it is fully functional. 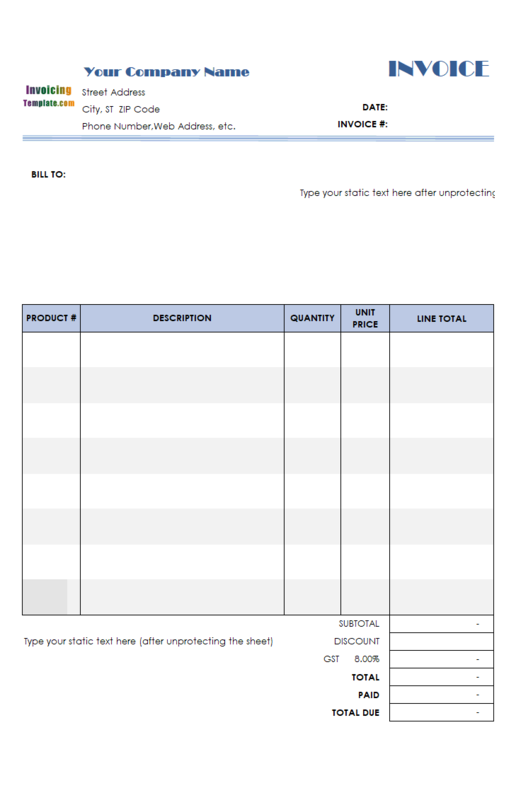 Like other form designs here on InvoicingTemplate.com, Form with 5 Price Levels is free (offered to you at a price of 0.00USD). It works on Windows XP and all newer versions of Windows, and Excel 2007, 2010, 2013 or 2016. 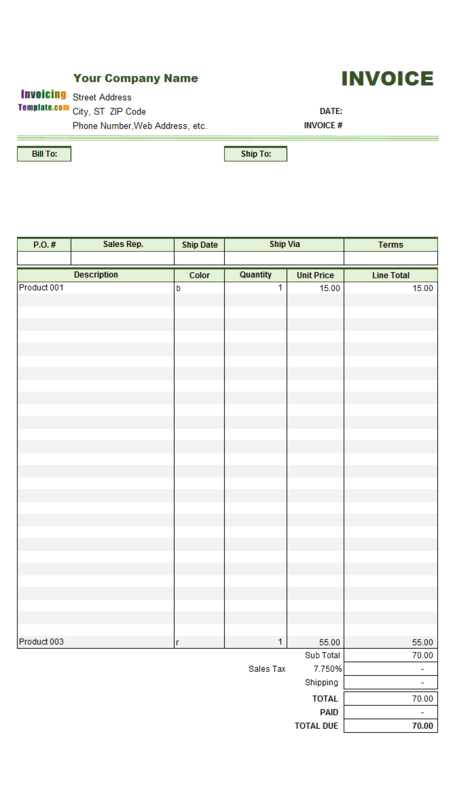 Removed all ActiveX controls from the sheet, or replaced the ActiveX objects with Excel form controls. 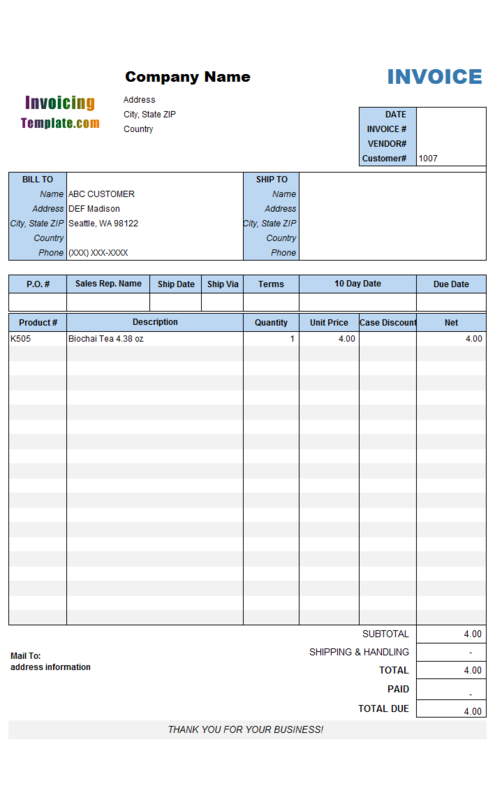 Moved the "Customer#" cell (cell name "oknWhoID") out of the printable area.